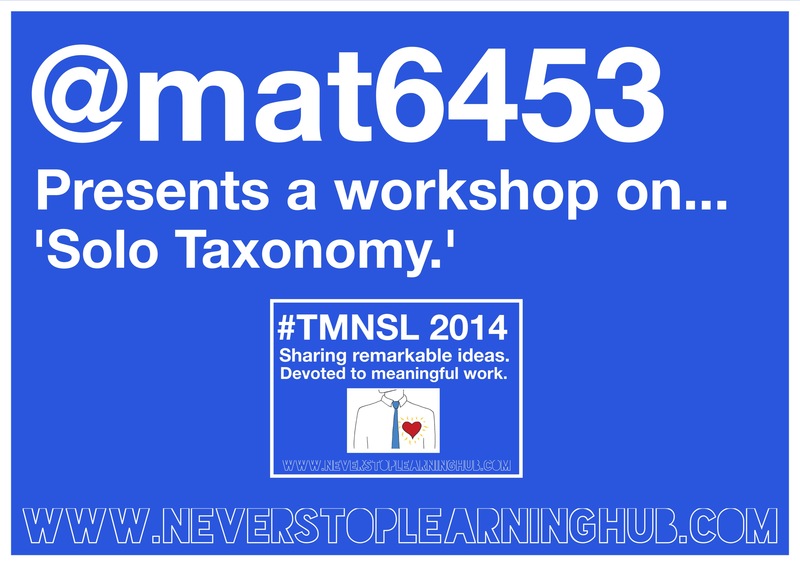 #TMNSL 20/03/2014 – Workshop resources: Stop doing I.T. wrong! Stop doing I.T. wrong by David Morgan. Digital learning is not something to be scared of or to be worried about. No one called it ‘Pen based learning’ when we moved away from slate tablets, but I’m sure there were a few people reluctant to change their ways, or that didn’t quite ‘get’ the point of pens. In any case, digital learning is here to stay and should be a part of every lesson in some form, if only because it saves you time! We’ve all seen the classic ‘do a PowerPoint’ lesson. *Sigh*. Yes, you know what I’m talking about; it’s the end of term, you’ve got a section of work on something researched based so you say the immortal lines, “Do a PowerPoint on it”… and four weeks later these digital natives have done two slides that make the content appear one letter at a time. 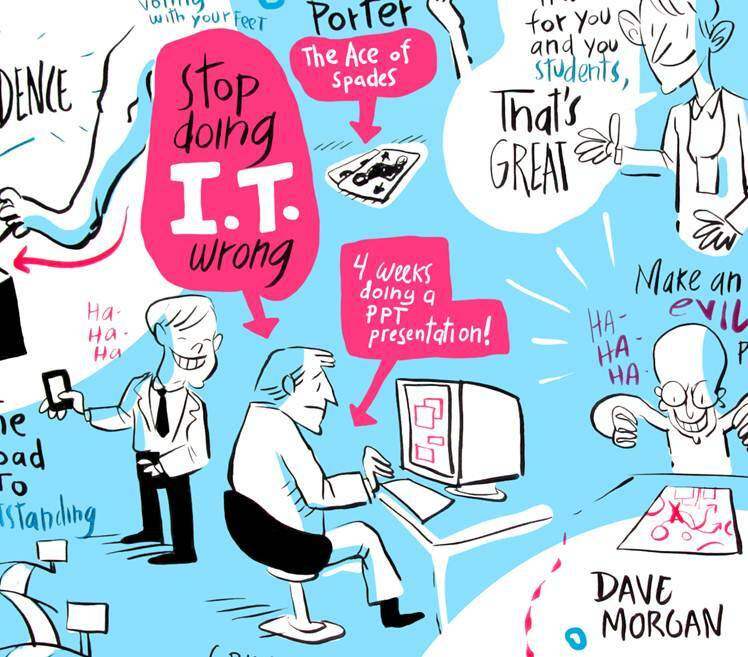 If students *are* digitial natives then should a PowerPoint take four weeks? 1. Get over yourself – you will never be as much of an expert in the technology as a student can be because they’ve got unlimited time to learn it. You have to just plan around that and have strategies for finding out: Classroom Genius: find someone in the class who’s the ‘genius’ at the tech you’re using and get them to be the first port of call for non subject specific questions. 2. The connected student – they’re being pinged all the time by Facebook, Twitter and Instagram. Why not leverage the fact they’ve trained themselves to respond quickly to notifications by doing that yourself? Using a tool like edmodo to push out work and ask questions turns simple things into pings that use the same action-reward mechanism that replying to a tweet does; and most importantly, it gets things done! 3. Print on Demand – I’ve covered this in my blog [http://www.lessonhacker.com/print-on-demand-for-better-learning/] but essentially it boils down to getting custom printed exercise books so you can force student to improve skills you want them to focus on. 4. Blur your classroom – Use a VLE of some kind for taking in work (I wrote about this in the most recent Teach Secondary magazine) and then mark using your mobile device whenever you’ve got some down time. Stood outside Next waiting for your other half? Whip out that phone and mark one or two. Waiting in the car for the football crowds to let out? Your mobile is your friend for quick marking. This means that your work life balance gets much better because whilst you might be marking more often, you’re doing it in ‘dead’ time and suddenly you don’t need to sit down and mark in an evening anymore. 5. Record a learning dialogue – using many online tools it’s easy to record the feedback and conversations your having about work and display the progress over time to that tricky Ofsted lot. One piece of kit I’m enjoying at the moment is Kaizena [https://kaizena.com] which allows you to record audio annotation over a Google doc. This is the quickest marking ever because you can highlight a section, click record, then just speak your feedback. Wowzers. 7. X-Factor your lessons – Why not use instant poll software like PollEverywhere [http://www.polleverywhere.com] to allow X-Factor style text voting in your lessons. AFL has never been so much fun. It means students can reply anonymously so closed questions work better, but it does have a free text response option which all updates live as a student texts in. Pure magic. 8. Plan for epic fails – so what’s going to happen if the computers don’t work? Make sure you’ve got a second strategy, an offline ‘go-to’ just incase because the very worst thing you can do in a lesson is wait for the IT guys to come along to fix things, you’ll lose your class’ attention almost instantly if they have any downtime, have something to do that requires dead-tree-tech so you can jump to it in an emergency. This doesn’t have to be well planned, just planned. 9. If you use new tech, use it more than once – because let’s face it. You’re probably not a Computing teacher, so if you do us a favour and teach a bit of software use then why not get a good return on your investment? Use the same tech three of four times, at least, which means that students stop asking you how to use it, and ask you what to use it *for*. 10. 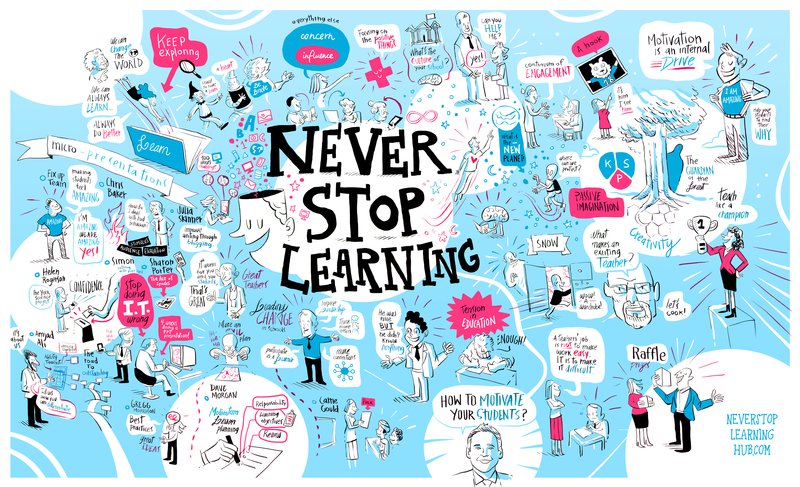 Sometimes you can do too much – I once had a year 13 student ask me, exasperated, if they could “just do things on paper today sir?”; so please don’t imaging that I expect every lesson to be an all singing, all dancing digital learning machine. No. What I’d like to see is more teachers using tech day-to-day and not worrying about it. At some point we’ll forget we ever called it digital learning and find the very idea that we differentiated between eLearning and Learning as a bizzare artifact of a bygone era. When even the most old fashioned teacher in the class thinks nothing of slapping on a pair of video-recording glasses and rocking out an epic lesson. 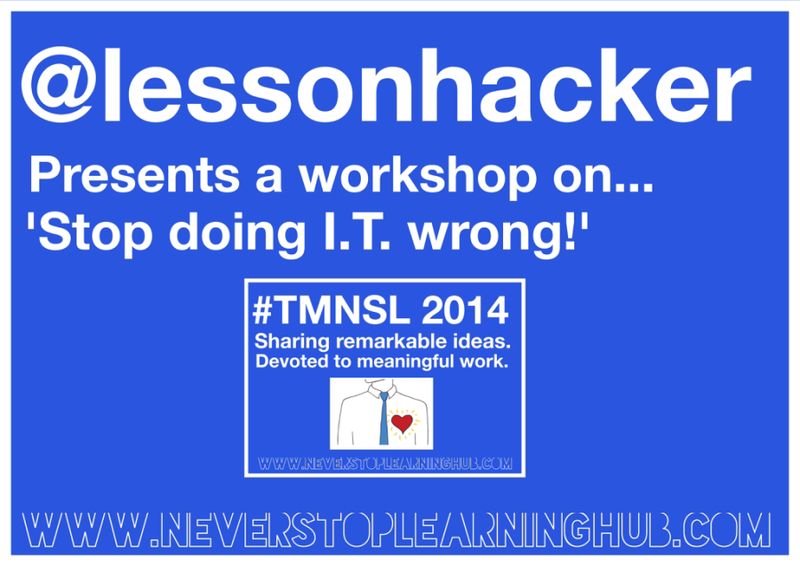 If you’re interested in finding out more then head to my blog [http://www.lessonhacker.com/] or read my book, which coincidentally has the same title as my workshop [http://www.stopgettingitwrong.com/] . Buy David’s book – Stop doing I.T. wrong! ‘Quick wins’ #16 – SLANT – Building habits in the classroom. Why? I’ve struggled to get 100% attention from students 100% of the time. Quite often when I instruct students I’ll use the “3,2,12 technique to get students attention, which works well. But I then struggle to retain attention. This is made especially difficult when teaching in a Computing room – the lure of the computer screen can be too much for students. A typical instruction will have to be halted within seconds to address students who’s eyes have wondered back to their computer screen. Possible solution. I needed a routine to retain student attention. I started my research by looking at Doug Lemov’s excellent collection of videos for his ‘Teach like a Champion’ book. I came across the video below. Sit up: What is the right posture to sit in the classroom? Is it to rest your head on your hands, sit slouched in your seat or put your head down on the table? These are all positions that will put students to sleep. In order to develop attentive listeners, it is essential to encourage students to sit up straight with their back against the seat, feet placed firmly on the ground and hands on the table. This is the optimal position to ensure good learning and processing of information. Lean forward: Another position that is critical to promote active listening is leaning forward. Students should be taught to lean forward during a lesson. It may also help teachers understand the interest level of the class and fine tune their presentation to make it more interesting for the students. Ask and answer questions: This component can liven up the classroom and encourage students to be active in their learning process. Encourage them to clarify their doubts, answer questions, and discuss or debate on ideas. These question and answer sessions can help activate their thinking, encourage critical analysis of the content and strengthen their understanding of the lesson. Nod your head: Nodding one’s head is a form of nonverbal communication to indicate that the lesson has been understood. When a teacher observes a student nodding his/her head, they may proceed with the lesson. On the other hand, failure to nod will signal that the student has not understood the lesson and the teacher may need to clarify or explain further. “N” can also stand for ‘noting down and naming key information’ which enables students to retain the information and makes learning stronger. Track the speaker: The attention span of every student is different. Tracking the speaker is a visual cue to be attentive. Students should be encouraged to track both the teacher and other students who are presenting in class. The conscious effort to track the speaker will help students to be attentive at all times and prevent them from getting lost or daydreaming in class. Taken from Professional Learning Board. Outcome. I am in the early stages of trialing this technique with Year 7, 8 & 9 students. I have found ‘Track the speaker’ particularly useful as a cue for students to pay attention to whoever is speaking. At the time of writing it has taken a lot of hard work to embed the routine but I am beginning to see more students listening to instructions and positively engaging in class discussions. Other teachers in my department have also started to embed these commands and the initial feedback from them is positive. One restriction at the moment is that students are only exposed to the routine in my classroom for 50 minutes a week so they don’t get to practice as often as I’d like. This means I have to continually remind them, but I believe the effort I put in is worth the outcome. Feedback. 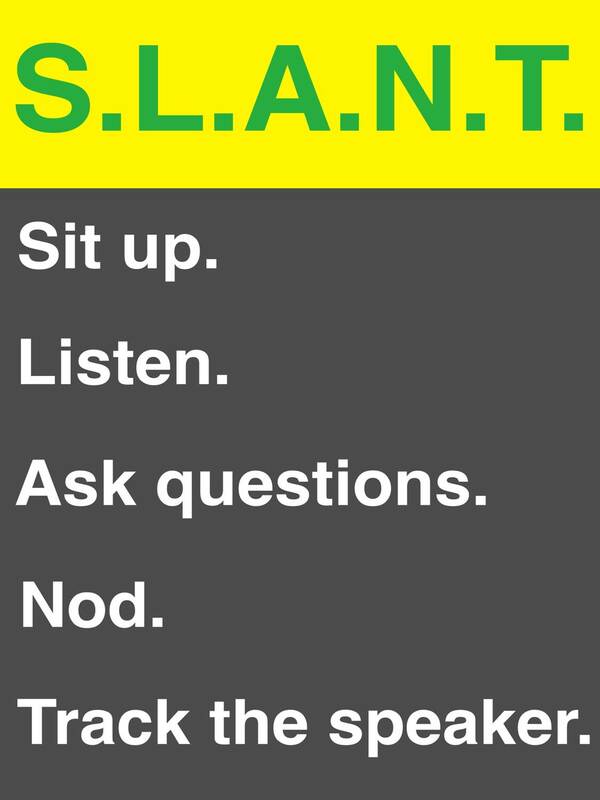 Please let us know how ‘SLANT – Building habits in the classroom’ worked for you. Leave a comment on this post or tweet us at @nslhub. The top two sound too much like hard work for busy teachers so in this workshop we briefly looked at the possibilities of differentiating by choice. A teachers’ job is not to make work easy. It is to make it difficult. If you are not challenged, you do not make mistakes. If you do not make mistakes, feedback is useless. Lev Vygotsky suggests that our students should operate within their ‘Zones of Proximal Development’. This involves facing challenges just beyond their current capabilities: a level of challenge that students can meet with help. Learning should feel tough, tricky, challenging, puzzling but not impossible. To provide a challenging level of learning we need to know our students. Ensure that you have simple, understandable and usable pupil data available and use this data when planning and structuring teaching and learning in your classroom. Data together with any other relevant information about your students is best collated on an annotated seating plan or student profile. Have this annotated seating plan to hand and in the forefront of your mind as you prepare fabulous lessons. Remember to also have their recently marked books with you too as marking should always inform your lesson planning. Start with the end in mind: plan for learning. Establish a clear objective and tangible outcomes avoiding the devil of low expectation – Must Should Could. Quite simply the wrong language to be using with teenagers! Same task, different level of challenge. When you differentiate, you plan for the most able in terms of outcomes and then look at how to overcome the barriers for other groups in your class to enable them to access these outcomes – you then adapt resources, support and grouping to differentiate. Research from Professor Robert Ornstein indicates that when learners feel as if they have some control and choice over the type of task that they are about to do, they feel positive and motivated. 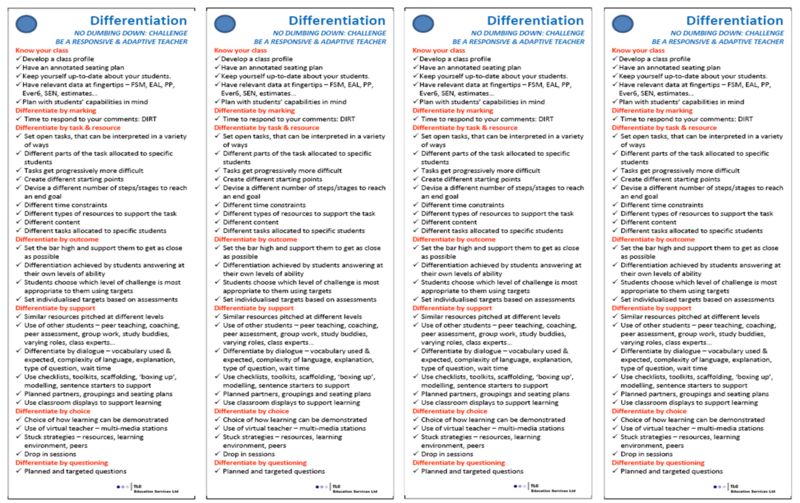 Differentiation bookmarks by Chris Moyse. 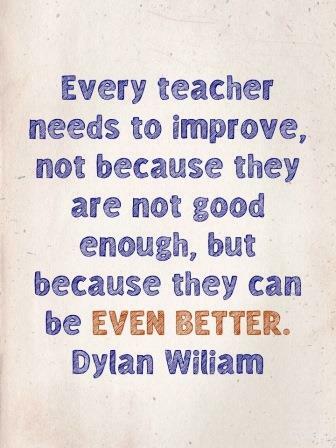 · Know your class and demonstrate this through annotated seating plans and student profiles. Use this ever-developing knowledge base to enable you to adapt your approach for who is in front of you. · Challenge them. Have high expectations. Present learning without limits. · Encourage your students to make and learn from mistakes. Then feedback can come into play. · Opportunities for students to express their understanding and articulate their thoughts should be designed into any lesson. The more you hear and see the more you find out and the better you plan, respond and adapt to what happens during the lesson. Great teachers are great listeners too. · Mark their books and provide your students with more work. Provide them with an opportunity to make your suggested improvements: the only time you will ever have 30 different lesson plans. 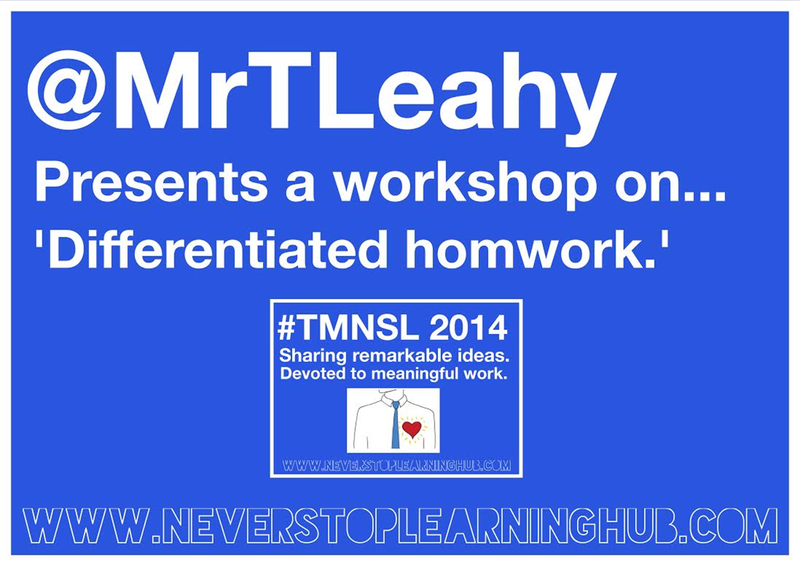 The workshop on Differentiated Homework came about due to us considering the differentiated lesson. 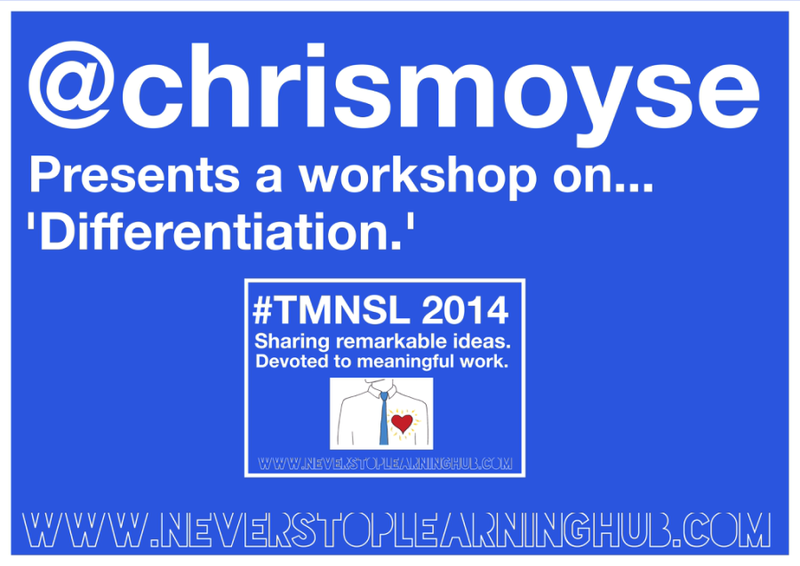 “We differentiate in lessons so we should differentiate homework…right?” Right! Why do you want students to complete homework? How do you want them do it? o Paper based or On-line? o How can you maintain this level of homework? o How much effort are you putting in when setting and marking the homework? o Basic questions on one side and an extension of the concept or a problem solving task on the other side. @sporteredu & @MrTLeahy on Twitter. ‘Solo Taxonomy’ by Mat Pullen. 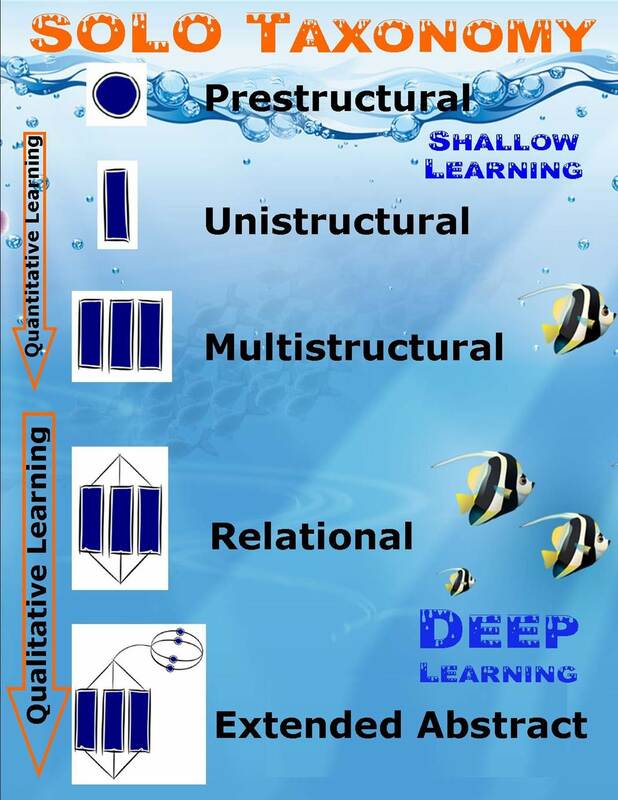 I have been thinking about SOLO taxonomy for a while and the impact it can have on student learning in PE. I have also looked at ways to make it easier for students to access. I have previously blogged about Project Based Learning here and the feedback has been really positive. both staff and teachers are engaged in this approach to co construction of the curriculum and lots of teachers are telling me about their plans for embedding it in their schemes. To move things on a bit I wanted to look at ways of supporting students to create their own learning models. To help facilitate the process of finding out what they need to improve on and where to find out how to do that. That is where the link with SOLO comes in. I have used SOLO to great effect in practical sessions and students are really showing great progress in lessons and more importantly they kbow what they need to do to keep progressing. In order to support this further I have created posters that I can use in sessions that allow the students to acces some visual cues to support them in their construction of lessons. The posters trigger augmented reality links to images and videos to help students check on technique and to assist in giving detailed feedback to each other. The process is fairly simple, I created a poster on my iPad using Comic Life. Add this image to Layar.com in their creator section, add in video and images to the relevent sections and voila, augmented reality posters. The students can now access these with any device with the Layar app installed. So now in a session, we start with students looking at a problem that they need to solve, they look at the skills they will need to develop to support them in overcoming the problem. Around the hall are posters with links to images and videos to help support their learning. They integrate numeracy to support their understanding of success, they use literacy to improve communication and feedback and they can see how they can progress using the SOLO stages. This is a real change in lesson structure but really engages students to be active whilst learning a whole wealth of key transferable skills. Why? The start of a lesson is extremely important for engaging students and getting them ‘hooked’ on the learning that is about to take place. It’s tough to do on a consistent basis. It needs lots of creativity from the teacher when planning the lesson and requires the teacher to know their students. Below is a summary of a #UKEdChat hosted on Twitter earlier this year with contributions by teachers from around the UK. What is your number 1 starter activity for engaging students as soon as they walk through your door? What is the 1 routine in your classroom that you couldn’t live without? Which top tip from tonight’s discussion are you going to use tomorrow? 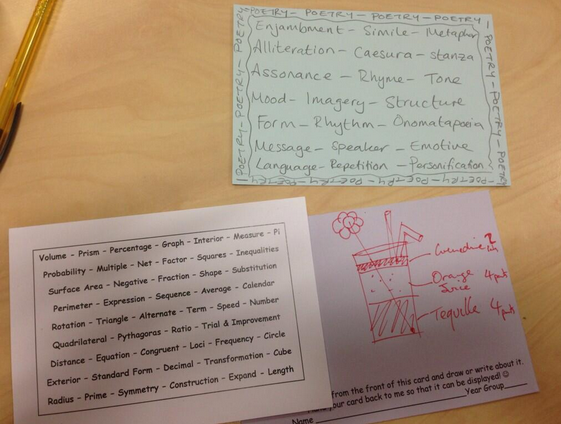 @teachertonytips Engaging question on a slip of paper given to kids in the queue outside classroom. @gceyre A Mystery – keep the students guessing and wanting to find out more. @with_ict Must work harder after assembly. Kids hold it together during and are often in need of an active exciting task afterwards. @with_ict After lunch register, response is giving a number out of 10 to show mood/feeling. It gives a good indication of playground drama. @georgeEblack After lunch, sympathise with them (who isn’t sleepy after lunch) have shorter tasks prepared, plan accordingly, build in down time. @ReachPsychology Be mindful that some Friday afternoon non-engagement behaviours are not about your lesson. Not every pupil loves the weekend! Engaging starter tweets – Archive supplied by @ukedchat. Contains lots of ideas for engaging starters!! Feedback. Please let us know how any of these engaging starters worked for you and your students. Leave a comment on this post or tweet us at @nslhub.